Miscellaneous Transactions are used to create adjustments for the missing or any in-accurate transactions. Change the organization to MIP (MM INV PUNE) as we would be creating the miscellaneous transaction in MIP organization. Now when we try to create the transaction we would be getting an error “NO OPEN PERIOD” as the period should be open to do any transaction in that period. The period is now open. Now we would be able to create a transaction. This would be showing on-hand qty availability as 700. Note: For miscellaneous transaction there would not be any reference like source as purchase order for receiving items, sales order for issuing items or inter-org transfer. Now to Create Statistics for the number of transactions created on Item. 2. Move order transactions are created to move the goods physically from store to another store or staging area within the same inventory organization. Note: No approval is created if the move order is coming from other sources. But approval is required for manual creating a move order. Note: Move order is to move the items from one sub inventory (store) to another sub inventory (store) in the same inventory organization. Let us consider a case where we have 700 qty in store 1 and we need to move qty from store 1 to store 2 or staging area. Find the move order by clicking FIND. Note: We can observe that the Line status has the value as SINGLE in allocation column; this is because the quantity is moved from a single store and the source is single store. But if the item are moved from multiple stores then the column will have value MULTIPLE. Next would be to generate MOVE ORDER SLIP Report. This report is handed over to the Store In change. Once we click on TRANSACT there would not be any lines visible in future if the item qty is fully available in the store, but in case there is no sufficient stock available then they would be a line with pending stock details. Here if we observe the system will automatically allocate the qty from the store from the store which is having the said qty. the system used the rules PICKING RULES defined for allocation of the qty for the item. We can also click on View/Update allocation and change the allocation qty. Sub-Inventory Transfers are only used for creating adjustments. There is no physical movement of stock. Now let us consider a case where in the stock is moved physically from one store to another in the same inventory org. but while moving the stock physically there is mismatch in the transfer and at the destination store has received a less quantity than the actual. So for this deficit quantity an adjustment is made both at the source store and the destination store. Store 1 is transferring 350 quantities physically of an Item to Store 2, but store 2 has received only 345 quantity of that item. So for this an adjustment transaction is created for Store 1 and store 2 where in store 1 will be adjusted with +5 qty and store 2 would be adjusted with -5 items. This is done because at the start there was a transaction in both store 1 and store 2 as item qty as 350, but only 345 is actually received by store 2. This adjustment transaction will create an adjustment entry and decrease/increase the on-hand quantity by 5 in both the sub inventories (Stores). Move Order Issue is used to issue the stock to a receiving location. Used to issue stock from store to some location. Remaining all the other process for a move order remains the same. 3. Inter-Organization Transfer is used to transfer the materials from one inv-org to another inv-org without any internal sales order as a source. FOB is Fright on board, this defines the responsibility of the source inv-org is defined. If the FOB is receipt then Source inv-org is responsible till the items are received at the destination inv-org and the shipment is been paid by the source inv-org. if the FOB is Shipment then the source inv-org is responsible only till shipment of the items and later on it’s the responsibility of the destination inv-org and the shipment charges are also taken case by the destination inv-org. Next in the SHIPPING NETWORKS form navigate to the Tab Primary Accounts and the Other Accounts Tabs and enter the accounts as 01-000-1410-0000-000. Once the shipping Network is been defined we can now transfer the Items from one Inv-org to another. Before this we need to assign the items in both the Inv-Organizations say MIP and MIG. Select the Assignment (√) against the line MIG. This would assign the Item to MIG Inv-Org. Here there would be an error as the Period for GOA Inventory Organization is not OPEN. Now we need to receive the Goods at GOA inv-Org. Now MIG is going to receive the items of QTY 100. 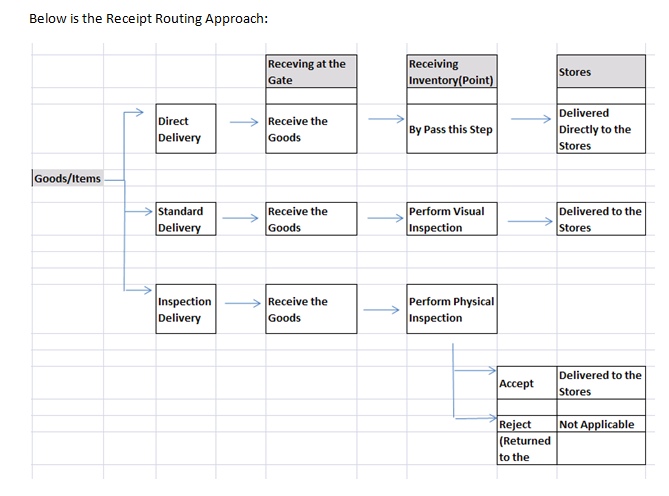 If we observe the Destination Type is INVENTORY, this is because the receipt routing is selected as DIRECT. There would be transactions created for this receipt. Now to check the Transaction that are created. There would be two transaction records Receive and Delivery. Now MIG is going to receive the items of QTY 50. If we observe the Destination Type is RECEIVING, this is because the receipt routing is selected as DIRECT. Now to check the Transaction that is created. Now going further to Receive the Items at the Store a transaction is to be done at the Receiving Point. There would be transactions created. One more record is created as DELIVERY TRANSACTION. Now MIG is going to receive the items of QTY 25. Going further there would be a case where in while physically counting the items in the Goa location they have observed that there are 2 Item Qty missing (Instead of 350 there are only 348) when they have checked with the Pune location they found that the missing items are available at Pune location which was missed to be transferred to Goa. But the ONHAND Qty is updated with 350. So we need to adjust the ONHAND qty in both the location. Transfer Type Direct for Adjustment entries. As the adjust are created in Goa location the From org would be GOA and To Org would be PUNE. Account alias issue and receipt will be covered later.